Hello Katie Girl: Buy More, Save More with Shopbop! Buy More, Save More with Shopbop! Every year it's always the same: I vow not to go out Black Friday shopping and I also vow to not look on the Internet for Cyber Monday. But who am I kidding? The deals are just too good to resist. 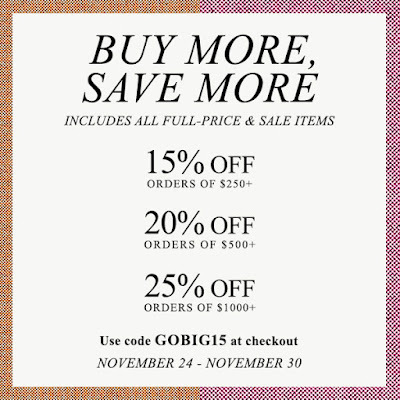 I'm excited about one sale in particular, which is happening right now: The Shopbop Buy More, Save More Sale. As the name suggests, the more you buy the bigger the discount you get, so it's the perfect place to do a little holiday shopping for loved ones or to pick up something, or a few things, for yourself this holiday season! Above are some of my picks for the sale. It was hard limiting my selection to just a handful of items, but the great thing about the sale is that it actually pays to buy more. Use the code GOBIG15 at checkout to get the discounts below on your purchases. Some exclusions apply which you can find here. Happy shopping!